Our approach is simple. We empower people! Each member has the ability to understand their own personal health risks, which are the leading indicators of health care costs, and address them using our clinically proven methods. By creating a customized solution for each individual member we are able to positively affect the outcomes for the populations we serve. Clearly Defined Goals: We work closely with our clients to determine clear and measurable outcomes. We provide detailed progress with a consistent cadence and clear transparency focused on both clinical and financial goals. Our ultimate aim is to reduce healthcare utilization by improving the lives of those we serve. Our vision is to Empower Communities to Add Life to Their Years and Years to Their Life…One Person at a Time! We approach Population Health Management as a population of one. Data and Evidenced-Based Approach: We take seriously our responsibility and obligation to ensure our analysis of a population and our interventions are based on proven and validated methodologies. We typically begin engagements with a full medical and pharmacy claims analysis to measure risk within a population and to determine outcome goals. In addition, we engage members to complete a Health and Wellness Assessment (HWA) with labs and biometrics. We take the data from these sources and build a tailored and personalized Preventive Plan for each member. 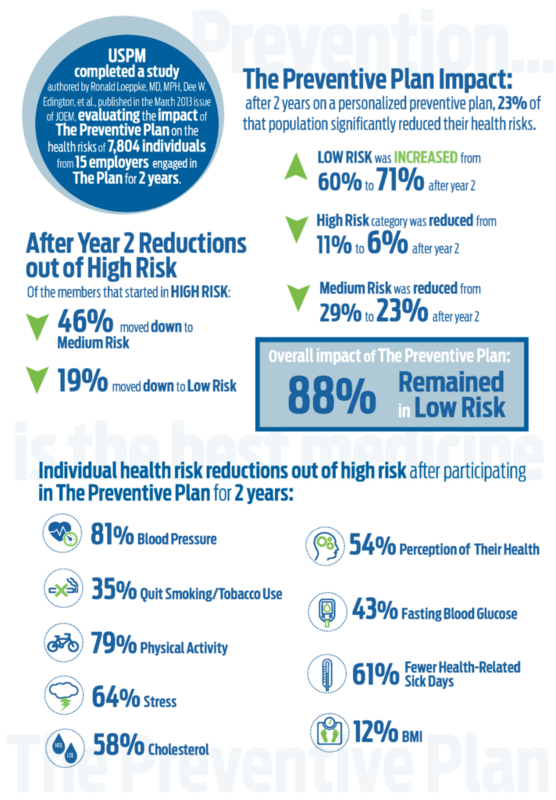 The USPM Preventive Plan® takes into account both lifestyle behavioral risks and disease acuity risks and delivers customized programs, interventions and content that meet members where they are in their journey of wellness. USPM uses clinical evidence-based interventions to drive sustainable behavioral change that ultimately lead to improved outcomes that we measure and report on a consistent basis. Collaboration and Culture: The start of a strong partnership always begins with collaboration and understanding of goals and expectations. We strive to ensure alignment of our programs to our client’s culture, processes, structure, operational norms, communication style, and their mission/vision. We assign a Client Relationship Manager and service team and provide detailed implementation plans, client toolkits, and ongoing support to optimize available resources and create a culture of health for the Client’s organization. We review results, build reporting dashboards, and communicate both positive progress as well as areas for improvement. We assess the Client’s organizational culture and various strengths, needs and opportunities for improvement related to health promotion and develop immediate and long-term strategies for program success to ensure participant engagement, ongoing participation and satisfaction, as well as improvement of health outcomes and productivity to maximize ROI. Sustainable Behavior Change: We believe strongly that short duration - high intensity programs do not create sustainable long-lasting behavioral change. Clinically vetted, proven programs and approaches that teach individuals coping skills, resiliency, personalization, and self-regulation is our coaching focus. The risk and severity-based coaching includes use of well-recognized behavior change techniques such as Transtheoretical Model, Motivational Interviewing, and Social Cognitive Theory. Pricing: Our clients shouldn’t pay for something they don’t use. Where economically feasible, we prefer to charge a per participant per month (PPPM) rate instead of the industry norm of a per eligible per month rate (PEPM). High Tech and High Touch: While technology solutions are critical to drive engagement and usability, technology alone is not enough to create sustainable behavioral change. USPM believes strongly that the human interaction is important to drive behavioral change that result in positive outcomes. USPM employs Health and Wellness Advisors, Coaches, and Care Managers to engage and empower individuals to succeed on their journey of health and wellbeing. Additionally, our health-focused personnel work together and collaborate to ensure we address the whole person and their health needs taking into account physical, emotional, social and financial concerns. The Preventive Plan includes tools, resources, and methodologies that are accredited by the highest quality standards, and have been successfully put into action by thousands of individuals across the U.S.
Our country is in the midst of a population health management transformation. USPM is at the epicenter because we deliver tangible results and measurable value to our clients and health care consumers. Health risk category groupings are related to total health costs, including medical and pharmaceutical costs, days absent from work, days on disability, workers’ compensation costs and worker productivity loss.